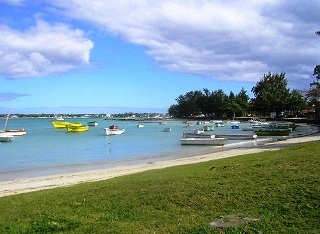 The best time to visit Mauritius is during the anti-cyclone months of May through October. Grand Bay, Balaclava Ruins, Belle Mare Beach, Ile aux Cerfs, Black River Gorges, Salt Pans, and the various gardens, parks and tropical forests are among the attractions of Mauritius. Activities include hiking and trekking, biking, deep sea fishing, surfing, windsurfing, water-skiing, cruising in yachts and submarines.The cuisine of Mauritius is a blend of Indian, African, Chinese and European influences. Daube de Poisson, and the Creole Curry are the most popular dishes. Mauritius Travel Pack by Globetrotter 978-1847732651 $12 Includes a pull-out travel map and good info spanning 128 pages on tips, best places to stay eat and shop, top attractions, regional profiles, area and transport maps, and best tours and excursions. Mauritius Travel Map by Globetrotter 978-1845376482 $9 1:80,000 Scale. The first stamps of Mauritius were a set of two stamps released in 1847 depicting Queen Victoria. The stamps are very rare – the only unused copies of the #2 are in museums while there is only one unused copy of #1 in private hands. Catalog value for that copy is in the one million dollar range. A set of four stamps in a slightly different QV design followed in 1848 and the stamps in that set and varieties are also extremely valuable. A set of stamps in the Britannia theme followed in 1858. Those stamps (Scott #9 to #11 and #12) are also sought after cataloging in the $1800 range for Mint and the $550 range for Used. QV and Britannia themes along with certain surcharge overprints were the primary stamp issues of Mauritius till 1895. A Coat of Arms set appeared in 1895 and that theme along with several surcharge overprints continued until 1910. Coat of Arms sets from the period are also valuable with one of them (Scott #200) cataloging for as high as $900 Mint and around $1600 Used. Mauritius released a set of fifteen stamps in 1910 showing Arms and King Edward VII (KEVII) key types. The set (Scott #137 to #151) catalogs for around $220 Mint and around $500 Used. This was followed by a set of nine stamps released between 1912 and 1922 in the King George V (KGV) theme. The set (Scott #152 to #160) catalogs for around $220 Mint and around $460 Used. A set of twelve stamps released between 1938 and 1943 that were King George VI (KGVI) key types. The set (Scott #211 to #222) catalogs for around $100 MNH and around $50 for Used. The issue was followed in 1948 by a set of four stamps to mark the centenary of first Mauritius postage stamps. Amazingly, this original issue set (Scott #225 to #228) with a distinct stamp on stamp design catalogs for just a dollar MNH or Used. A long set of fifteen stamps released on March 16, 1965 in the Birds of Mauritius theme. The set (Scott #276 to #290) catalogs for around $60 MNH and around $35 for Used. The designs show Rodriguez Fody, Olive White-eye, Mauritius Paradise Flycatcher, Mauritius Fody, Rose-ringed Parakeet, Cuckoo Shrike, Mauritian Kestrel, Pink Pigeon, Mauritius Olivaceous Bulbul, Mauritius Blue Pigeon, Dodo, Rodriguez Solitaire, Van den Broeck’s Red Rail, and Broad-billed Mauritian Parrot. The set was followed in 1967 with another set of four stamps in the same theme. That set (Scott #302 to #305) catalogs for around $3 MNH or Used. The designs show Rodriguez Bush Warbler, Newton’s Parakeet, and Mauritius Swiftlet. The set is relatively inexpensive and catalogs for around $3 MNH or Used. There is a reissue of the first set released on December 1, 1967 with the ‘Self Government 1967’ overprint. That set (Scott #306 to #320) catalogs for around $20 MNH or Used. Dodo, depicted in the first set was endemic to Mauritius but became extinct in the late 17th century due to human activity. The phrase “dead as a dodo” comes from the extinct status of this bird. A set of four stamps released on October 7, 1983 in the Fishery Resources theme. The set (Scott #570 to #573) catalogs for around $5 MNH or Used. The designs show Fish Trap, Fisherman in Boat, Game Fishing, and Octopus Drying. A set of twelve stamps released on October 9, 2000 in the Fish theme. The set (Scott #910 to #921) catalogs for around $8 MNH and around the same for Used. The designs show Scarus Ghobban, Cephalopholis Sonnerati, Naso Brevirostris, Lethrinus Nebulosus, Centropyge Debelius, Amphiprion Chrysogaster, Forcipiger Flavissimus, Acanthurus Leucosternon, Pterois Volitans, Siderea Grisea, Carcharhinus Wheeleri, and Istiophorus Platypterus. The first coins of Mauritius were French Coinage (20 Sols – Sous = 1 Livre, 100 Cents = 1 Rupee) Silver Sous issued in 1822. The first issues are valuable cataloging upwards of $150 for XF. Proofs go well into the 100s. Commonwealth Standard Coinage (100 Cents = 1 Rupee) debut in 1877 with the issue of Bronze Cents that showed QV head portrait in Obverse and Denomination within circle and Date in Reverse. Those issues are valued upwards of $50 in UNC. Commemorative Gold Proofs were issued starting with the 200 Rupees 0.4587 troy ounce gold coin of 1971to mark Independence. The issue has low mintage (2.5K, Proof – 750) and is valued at a sizable premium over bullion value. Coins $2 and up Common UNCs from the 1980s onward starts around $2. KGV Silver Coins from the 1930s in VF, Recent UNC Sets KGVI UNCs, etc start around $20. High Grade Silver Coins from the 19th century, Recent Commemorative Silver Proofs in Low Mintage, First Issue Silver Coins of 1822 in VF, etc go well into the 100s. Paper Money $3 and up Common UNCs starts around $3. High Value Recent UNCs, UNCs from the 1960s, etc start around $10. Certain Withdrawn Error UNCs from the 1990s, Scarce Replacements in UNC, etc start around $50. UNC Bundles, High Value Consecutive Serial Number Sets with 5-pieces or more, etc go well into the 100s. Art $10 and up Original 19th century local scenes photographs and historical pictorial documents start around $10. Miscellaneous Collectibles $3 and up Boy Scout Patches, Stickers, and postcards start around $3. Mauritius Knight Service Medals start in the 50s. Italy Order of Mauritius Medals, 1890s Royal Visit Original Documents etc start into the 100s.